Soft gel reduces friction and help prevent the incidence of skin breakdown. Comfortable gel pads for forearm crutch users. The Crutch Mate Gel Forearm Crutch Pads are made from a unique glycerin gel that is designed to provide long lasting comfort. 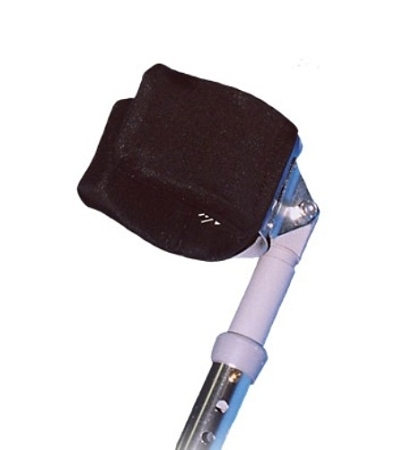 These forearm crutch pads are designed to prevent hard spots, reduce friction and help prevent the incidence of skin breakdown. 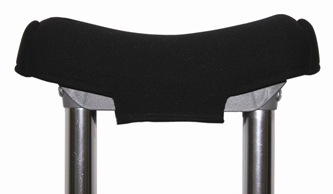 Elastogel Gel Forearm Crutch Pads are especially useful for individuals who utilize crutches for longer periods. To install, simply stretch the grip pad over the existing grip, making sure the stitching is on the underside of the grip. To clean, wipe down with a damp cloth and mild soap or disinfectant. Crutch Mate Gel Forearm Pads are sold as a pair. Q: How wide are they.? My crutch’s arms are 4cm wide? Q: Is this just the black pad that you fit onto the cuff or does this include the cuff, and top of the crutch that fits onto a longer bottom piece? What crutch brands do they work with? I have Guardian and Rubbermaid forearm crutches. A: The Crutch Mate Gel Forearm Pads are U shaped and stretch over your existing cuff, it should cover the sides and the back. They fit most crutches because they are stretchy so it should fit your crutches.